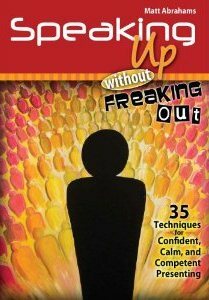 Speaking up without freaking out is a special book for presenters. It talks about only one thing; how to reduce your anxiety (nervousness) before a presentation and while presenting. I received a free review copy of the book from Matt Abrahams (the author). Matt Abrahams shares 35 techniques to help reduce your nervousness. Why so many? The assumption being you can pick up techniques which you feel apply to you. The book is divided into 5 chapters. 1) What is speaking anxiety? 2) Why we feel anxious before a presentation and how to deal with it? 3) How to better remember your presentation content? 4) How to stop some self-defeating beliefs which increase your anxiety? 5) How to put all this learning together? There is an interesting thing about the source of anxiety in this book. If you are anxious about making a presentation, it can be due to many reasons. One, you do not have the skill. Two, you have come to associate public speaking as something fearful. Three, standing in front of a crowd releases chemicals in the body and you feel afraid. Four, you do not know what a presentation actually you. You feel there is only one right way of doing it. Hence you memorise everything. You then fear you might not remember what you memorised and feel afraid. There is a solution for each type of anxiety. You first need to know why you feel anxious and then search for techniques which can help you. I will share a comprehensive summary of the major techniques in my next post. What's good about the book? 35 techniques to help you reduce presentation related nervousness. There will be many techniques which will benefit you. Short book. Just 85 pages. The approach of the book is very academic. Parts of the book reads like a text book on anxiety. There is jargon. Though the jargon has been explained in plain language, coming across jargon again and again makes it difficult. There are few stories on actual people having used these techniques and got results. There could have been more stories. If giving a presentation makes you sweat and makes you nervous, it would be a good idea to read this book. I compared its price to other books I have reviewed before and the price seems a bit premium. Rs. 745 on flipkart (India) is a bit costly for Indians. The pricing is premium in the US and the UK as well.